Tuesday 9th October saw our Utilities Manager, Steve Claybrook and Digital Strategy Manager, Michael Austin attending the Construction Enquirer Awards held at Birmingham’s Hilton Metropole Hotel. Presented by celebrity architect George Clarke, the awards are set up to recognise the UK’s best contractors, specialists and suppliers to work for in the construction industry. They are the showpiece of ‘UK Construction Week’ – the UK’s largest built environment event which consists of nine shows: Timber Expo, Build Show, Civils Expo, Plant & Machinery Live, Energy 2019, Building Tech Live, Surface & Materials Show and HVAC 2019. 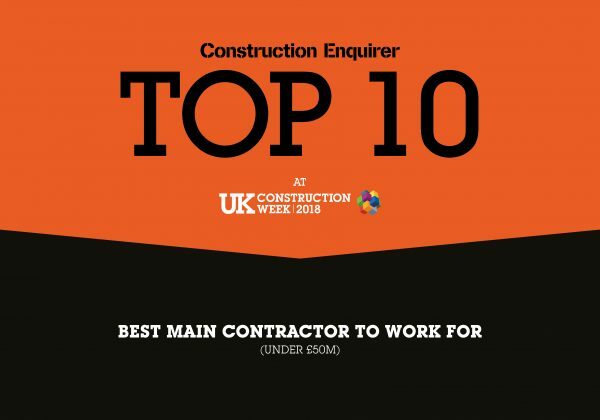 Knights Construction Group was nominated in the awards category of ‘Best Main Contractor to Work For (under £50m)’ and despite missing out on being named as the overall category winner, we are delighted to have been named in the ‘Top Ten Winners’ for the category.